Free Willy Really Was Free! Keiko, the star of the Free Willy movie, surfs down a wave in the open ocean in Iceland. Keiko spent months out in the open ocean. There are numerous records of captive cetaceans being released into the wild. 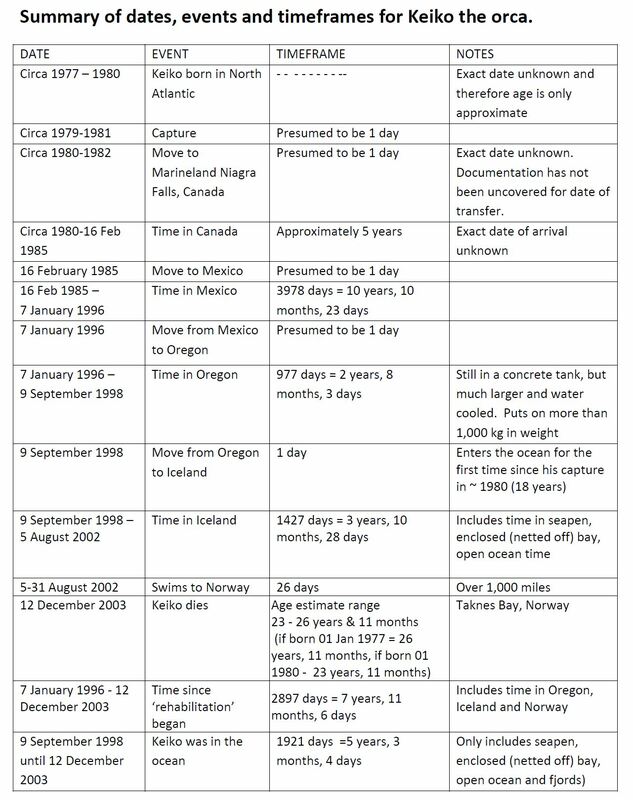 Here is a table that the Free Morgan Foundation prepared showing the releases of other cetaceans (which we could find information about). See the story of FREE WILLY (Keiko) below and that of an other called Springer. These stories give details on how the process works and what we have learned. There are others cetaceans, which are not included in this table the Free Morgan Foundation has compiled, which have been released. But for these animals, details have not been publicized. If you know of any such releases (or of published accounts that we have missed off our list) or if you have any unpublished data (or know where we can source that data), we would be interested in hearing from you. Please contact us. Thank you. Such accounts of Keiko’s life are misleading. Although considered an unlikely candidate for rehabilitation and release because of his length in captivity and capture at a very young age, Keiko embraced his new life in the ocean after being airlifted from his tank at the Oregon Coast Aquarium to an ocean pen in Iceland. Over the course of five years, Keiko engaged with wild orca pods and on a number of occasions left his caretakers for days at a time. When he swam from Iceland to Norway, Keiko journeyed more than 1,000 miles on his own, showed strong evidence of having fed himself and continued to thrive for 15 months after he arrived in Norway. He spent the time from 9 September 1998 until 12 December 2003 in the ocean – that is, 1921 days (5 years, 3 months, 4 days) in the ocean, in the ocean which includes his time in the seapen, in the enclosed (netted off) bay and the open ocean and fjords. Timeline showing where and when Keiko was captured, held and moved. Details also given of the time that Keiko spent in a seapen, in the enclosed bay and the ocean. To help clarify issues that surround the release of captive orcas, and learn about the true story of Keiko, the media and the marine park industry are urged to watch Keiko The Untold Story and engage in an open discussion of Keiko’s life before and after captivity. Free Willy is a 1993 American film released by Warner Bros. under its Family Entertainment label. The film stars Jason James Richter as a young boy (called “Jesse”) who befriends an orca, named “Willy”. Willy is held in captivity in abysmal conditions in an entertainment park. In the movie, Willy goes free. In real life he remained in the tank he starred in, during the film. Children from around the world created an outcry and WIlly, who’s real name was Keiko, was taken on a real journey to freedom and a life outside a concrete tank and the joy of not having to perform tricks for his meals. All too often Keiko’s release from captivity is cited as a failed project and the reason that other captives should not be released and yet as this film so clearly demonstrates, Keiko thrived. This is the story that the marine mammal captive industry does not want you to know. Keiko the Untold Story is the first in-depth cinematic look at the life and legacy of the “Free Willy” Star. The filmmaker goes behind the scenes and allows the audience inside access to Keiko’s epic journey, told by those responsible for his care throughout his journey from captivity to release in his home waters of the North Atlantic. For every Keiko The Untold Story DVD sold from this site, the Free Morgan Foundation receives a portion of the proceeds in order to give financial assist help with Morgan’s plight at the same time educating the public about the truth regarding Keiko’s release. Purchase the DVD and Soundtrack of “Keiko the Untold Story” and help Morgan!